HomeFinancialAre We Fiddling While Rome Burns? Solutions abound, but they require the retirement of obsolete systems that defend entrenched interests and soul-crushing inequalities. It turns out Nero wasn’t fiddling as Rome burned–he was 60 km away at the time. 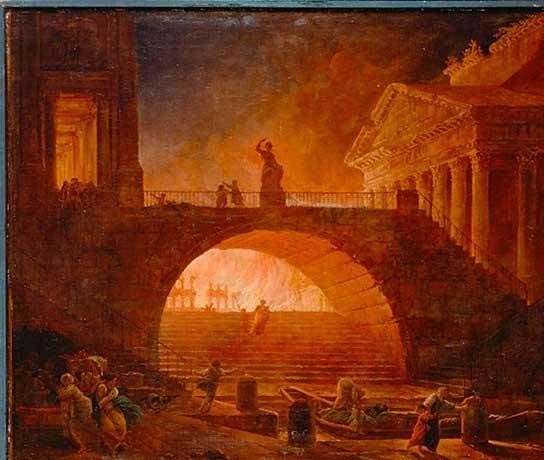 Did Nero Really Fiddle While Rome Burned? The story has become short-hand for making light of a catastrophe, either out of self-interest (one theory had Nero clearing a site he desired for a palace with the fire) or out of a mad detachment from reality. Are we fiddling while Rome burns? I would say yes–because we’re not solving any of the structural problems that are dooming the status quo. Instead, we’re allowing a corrupt, corporate mainstream media to distract us with fake “Russians hacked our election” hysteria, false “cultural war” mania, and a laughably Orwellian frenzy over fake news which magically avoids mentioning the propaganda narrativespushed 24/7 by the mainstream media–narratives that are the acme of fake news. The media is only half the problem, of course; the audience doesn’t want to hear about structural problems that can only be fixed by disrupting the status quo. If we don’t accept that the financial system we inhabit is imploding, maybe all the problems will go away. The system is coughing up blood and we still want to believe it is “recovering” from a cold. 1. Soaring inequality and the institutionalization of economic privilege.Systemic economic privilege doesn’t exist in a vacuum–it’s enforced by a centralized hierarchy, a dynamic I describe in my book Inequality and the Collapse of Privilege. Systemic inequality doesn’t just undermine the economy–it also undermines the social and political orders. 2. The central state (government) has one default setting: endless expansion into every nook and cranny of daily life. There are no mechanisms for contraction and no institutional memory of government reducing its control of every aspect of life. As I explain in my book Resistance, Revolution, Liberation: A Model for Positive Change, this concentration of power attracts concentrations of wealth which then buy the machinery of governance: democracy is reduced to an auction that excludes the bottom 99.9%. 3. Finance has detached from the real-world economy, distorting every function via financialization, which concentrates income and wealth in the hands of the few. As I have often explained in the blog (and in my book Why Our Status Quo Failed and Is Beyond Reform), if we don’t change the way we create and distribute credit-money, we change nothing. 4. Our educational system is obsolete but the the current system is incapable of transformation for structural reasons. These include high sunk costs, bureaucratic sclerosis, self-serving fiefdoms that fear disruption of their gravy trains, a lack of understanding of the emerging economy, a dysfunctional centralized hierarchy and the state-funded exploitive machinery of student-loan debt. I explain all this and present a model that would cut costs by 90% in my book The Nearly Free University and the Emerging Economy. 5. The economy and thus our society (i.e. our mode of production) are changing beneath our feet in dramatic ways. Highly centralized hierarchies (government, corporations) are the wrong unit size and structure to manage this transformation to the benefit of all rather than to the benefit of the few. I present a decentralized non-state, non-corporate, non-financialized model in my book A Radically Beneficial World: Automation, Technology & Creating Jobs for All. For individuals navigating these disruptive forces, I wrote an overview guide to the emerging economy, Get a Job, Build a Real Career and Defy a Bewildering Economy. Solutions abound, but they require the retirement of obsolete systems that defend entrenched interests and soul-crushing inequalities. The world is changing rapidly, and centralized systems that worked well in the past are failing because they are optimized for a world that no longer exists. The status quo is coughing up blood, and the situation is dire. Denial won’t fix what’s broken, and neither will magical thinking (the economy is “recovering,” symbolic gestures and virtue-signaling will fix everything, etc.) Clinging to the absurd hope that the status quo just has a nagging cold will only increase the disorder when the system breaks down.